This Alternating Pressure Cushion incorporates the newest alternating pressure technology to prevent and heal pressure ulcers. The Alternating Cushion uses a rechargeable portable battery that is user friendly. The top layer of the cushion uses a gel infused memory foam to help to reduce heat build up on the skin. The bottom layer consists of 3" cells that will alternate under the patient to heal and prevent up to stage 4 bed sores. The pump is whisper quiet and you can easily adjust the firmness and softness of the cushion with a push of a button. The pump can change from static to alternating allowing patient to suspend the alternating pressure mode for transfer purposes. The pump includes adjustable cycle times for pain management and advanced healing options. The cover is low shear and removable and washable. The cover reduces friction and is waterproof. This alternating pressure cushion offers the best benefits of the hospital grade pressure mattresses. It is extremely comfortable and offers superior pressure relief for at risk patients. This cushion can be used on a chair, wheel chair, car, or any seating surface. AVAILABLE SIZES 18X16X3" 16X16X3" 20X16X3"
This Alternating Pressure Cushion incorporates the newest alternating pressure technology to prevent and heal pressure ulcers. The Alternating Cushion uses a rechargeable portable battery that is user friendly. The top layer of the cushion uses a gel infused memory foam to help to reduce heat build up on the skin. The bottom layer consists of 3" cells that will alternate under the patient to heal and prevent up to stage 4 bed sores. The pump is whisper quiet and you can easily adjust the firmness and softness of the cushion with a push of a button. The pump can change from static to alternating allowing patient to suspend the alternating pressure mode for transfer purposes. The pump includes adjustable cycle times for pain management and advanced healing options. The cover is low shear and removable and washable. The cover reduces friction and is waterproof. This alternating pressure cushion offers the best benefits of the hospital grade pressure mattresses. 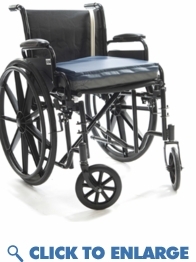 It is extremely comfortable and offers superior pressure relief for at risk patients. This cushion can be used on a chair, wheel chair, car, or any seating surface. Alternating Pressure seat cushion with gel infused foam topper. Fully customized digitalized pump with comfort control range and adjustable cycle times. AC power supply with Ni-MH rechargeable battery. Low shear water proof cover to prevent friction and heat.